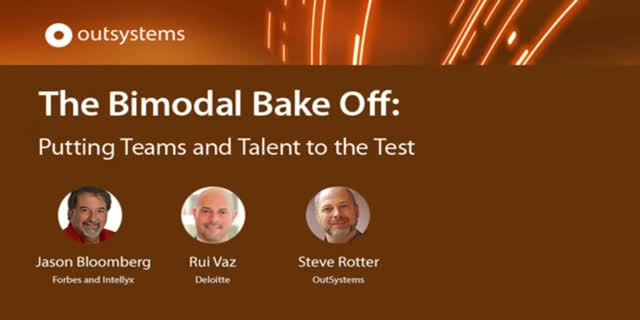 Bimodal IT is putting even the most talented development teams to the test. No matter if you support or oppose the idea of two distinct speeds of IT, you’ll want to hear Jason Bloomberg from Intellyx and Deloitte’s Rui Vaz debate and discuss the realities of taking a bimodal approach. It’s no secret - low-code platforms accelerate digital transformation. They cut app dev time, they help you bring new innovation to market faster, and they catalyze disruption. And, although time-to-market is apparent, the real question is what is the ROI to the business? So, we sought to quantify the real impact faster development times have in terms of cost, benefits, payback, and real ROI. To do this, OutSystems engaged Nucleus Research to provide objective reports on the quantitative benefits of our low-code platform. Join us and Nucleus Research as we explore the measurable benefits that you’ll enjoy when taking a low-code approach to development. We’ll also share the quantitative results of some recent customer projects and dissect the methodology for determining ROI. * How Japanese electronics company Ricoh achieved a six-month payback and a 253% ROI. * How Worcestershire County Council, a UK Government agency, built 30 new applications and saw a 442% ROI. * How to build your own business case for low-code by identifying ROI, payback, NPV, TCO, and other metrics. Join us for this exciting webinar! OutSystems 10 is the first low-code development platform to unveil advanced capabilities for enterprise mobile applications. Great UX, secure offline, cross-platform, deep integrations and much more. Check out this webinar to learn how the number one low-code platform has transformed mobile app development. * Build mobile apps once and run them anywhere. * Create high-performance, smooth and highly responsive user experiences. * Drag and drop native device and sensor capabilities into your apps. * Build sophisticated and secure offline experiences. Join Mike Hughes from OutSystems as he demonstrates how OutSystems 10 can help you cut development time in half. Digital transformation is moving at lightning speed. Join OutSystems CEO Paulo Rosado and a panel of battle-proven experts from PWC, HaelthTech, and Thrivent as they dish out best practices for planning, launching, and expanding your digital transformation journey without crashing. Speed is critical for any successful digital transformation strategy. Learn how to ensure you have the right tech stack to speed your digital transformation journey from Forrester analyst John Rymer and our own Steve Rotter. The need for speed to compete in the market requires insurers to create an agile company, capable of responding to market opportunities and changes. Technology solutions must be developed, deployed, and revised more rapidly to support business strategies. Join Mark Breading of Strategy Meets Action Research to discover the compelling need for a strategy to navigate digital transformation across the enterprise.